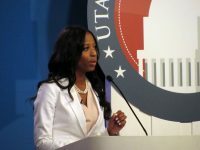 Every seat in the Karen Gail Miller Conference Center was filled Monday as Ben McAdams and Congresswoman Mia Love debated issues and problems that plague Utah, their district, and the rest of the country. Salt Lake Community College President Deneece Huftalin gave the opening remarks, citing the importance of educating voters of the 4th Congressional District about their candidates while also putting an emphasis on civility in politics. 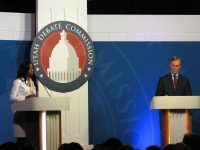 While a majority of questions centered around national issues, candidates responded to a few local topics, including Utah’s air quality and medical cannabis. When asked what they would do to improve Utah’s air quality, both candidates replied with unspecific answers that only seemed to attack one another. The only question that the candidates shared similar views on was whether or not they will personally be voting for Proposition 2. 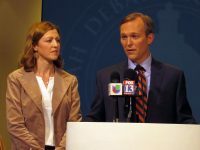 “Yes, I am going to vote for Prop 2,” McAdams said firmly. Love didn’t say whether or not she was voting for it, but gave some evidence of support by saying she has previously supported medical cannabis research bills and bills to reschedule cannabis from the Schedule 1 category. “I have long supported medical marijuana out of compassion,” she said. The rest of the questions were common in political debates, focusing on paying the national debt, fixing social security, and immigration. One question that was asked related to the newly started trade war with China. Both candidates seemed to talk about fixing and renegotiating trade deals if they harm Americans. McAdams pointed to the newly imposed tariffs on China as something to fix. “I do not support the tariffs imposed by the President,” he said. 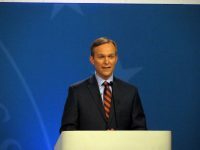 Both of the candidates provided a great energy and compassion, while also remaining professional and composed. Read our 4th Congressional District election article to learn more about where each candidate stands on other key issues. 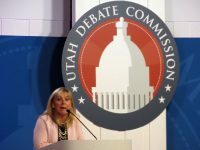 Salt Lake Community College President Deneece Huftalin offers her opening remarks before the start of the Utah 4th Congressional District debate on Monday night at Miller Campus. 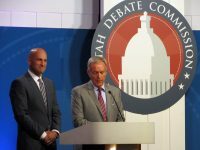 Mark Wright, left, and Scott Howell, co-chairs of the Utah Debate Commission, introduce the candidates for the Utah 4th Congressional District debate on Monday night at Miller Campus. 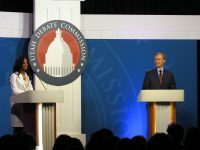 GOP Rep. Mia Love and Salt Lake County Mayor Ben McAdams stand behind their lecterns during the Utah 4th Congressional District debate on Monday night at Salt Lake Community College. GOP Rep. Mia Love answers a question during the Utah 4th Congressional District debate on Monday night at Salt Lake Community College. 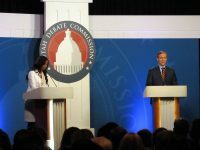 GOP Rep. Mia Love and Salt Lake County Mayor Ben McAdams listen to the next question during the Utah 4th Congressional District debate on Monday night at Salt Lake Community College. 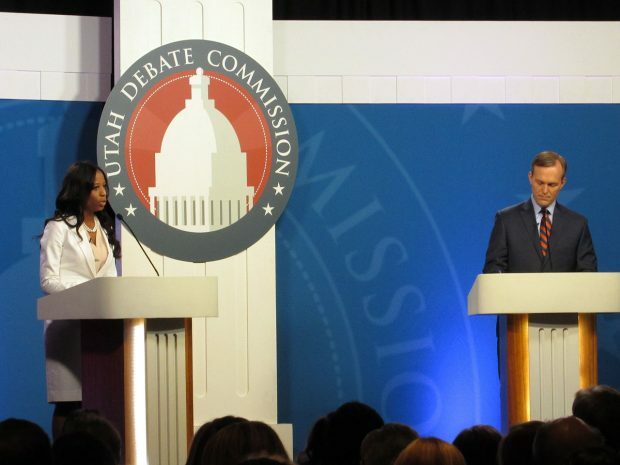 GOP Rep. Mia Love answers a question as Salt Lake County Mayor Ben McAdams listens during the Utah 4th Congressional District debate on Monday night at Salt Lake Community College. 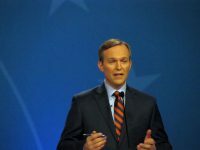 Salt Lake County Mayor Ben McAdams answers a question during the Utah 4th Congressional District debate on Monday night at Salt Lake Community College. Salt Lake County Mayor Ben McAdams answers a question while GOP Rep. Mia Love listens during the Utah 4th Congressional District debate on Monday night at Salt Lake Community College. GOP Rep. Mia Love smiles during the Utah 4th Congressional District debate on Monday night at Salt Lake Community College. 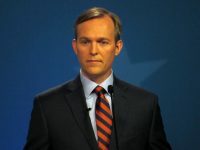 Salt Lake County Mayor Ben McAdams listens to the moderator during a debate against GOP Rep. Mia Love on Monday night at Salt Lake Community College. Salt Lake County Mayor Ben McAdams answers questions from the media as his wife, Julie, watches after a debate versus GOP Rep. Mia Love on Monday night at Salt Lake Community College. 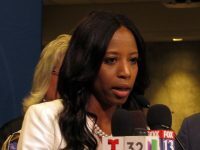 GOP Rep. Mia Love responds to questions from the media after a debate versus Salt Lake County Mayor Ben McAdams on Monday night at Salt Lake Community College.